Bremia lactucae is one of the most devastating and widespread pathogens in lettuce production worldwide. Despite its economical importance, uncertainty prevails about the species delimitation in the genus Bremia. Commonly, Bremia is considered to be monotypic, containing only Bremia lactucae, while taxonomists have described additional species, and molecular phylogenetic studies have shown significant sequence divergence between accessions from different hosts. Here, we report that several previously described species are genetically highly distinct from Bremia lactucae parasitic to Lactuca sativa. These include Bremia lapsanae, Bremia sonchicola, and Bremia taraxaci. In addition to these host-specific species, a plurivorous species is revealed, which infects hosts from three different tribes in the Asteraceae subfamilies Asteroideae and Carduoideae. The broad host range of clade 1 is exceptional for downy mildews and only paralleled by Pseudoperonospora cubensis, which infects a broad range of Cucurbitaceae. The taxonomic status of Bremia cirsii and of Bremia centaureae remains unresolved, as the accessions from Cirsium and Centaurea, respectively, did not form a monophylum but were partly contained in the plurivorous clade 1. Bremia lactucae was found to be restricted to Lactuca sativa and Lactuca serriola. Thus, it can be assumed that Bremia infections on weeds apart from Lactuca species do not pose a significant risk for lettuce production. 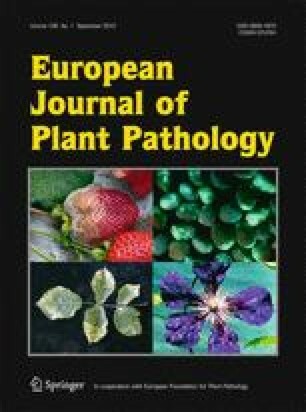 However, it is unlikely that breeding resistance genes from Lactuca serriola into Lactuca sativa will result in durable resistance of lettuce to downy mildew disease, because the current study provides additional evidence that Bremia accessions from both hosts form a population continuum. The curator of the herbarium KR is gratefully acknowledged for sending a specimen of Bremia parasitic to Arctium, and Richard Michelmore for sending a specimen from Helichrysum. The present study was financially supported by the research funding programme “LOEWE—Landes-Offensive zur Entwicklung Wissenschaftlich-ökonomischer Exzellenz” of Hesse’s Ministry of Higher Education, Research, and the Arts and by a grant from the German Science Foundation (DFG) awarded to MT.